Hyde Park, NY – Missy Robbins, executive chef and owner of Lilia in Brooklyn’s North Williamsburg neighborhood, was commencement speaker at the New York campus of The Culinary Institute of America on July 7. Chef Robbins was a 2017 James Beard Foundation Award nominee for Best Chef: New York City. Lilia, her first restaurant, opened in 2016 to critical and popular acclaim, earning a three-star review from The New York Times. Before creating her own concept, she spent five years as executive chef for A Voce restaurants in New York City, earning a star in the Michelin Guide at two different A Voce locations. Chef Robbins was a 2010 Food & Wine magazine Best New Chef. The Connecticut native’s first cookbook, Breakfast, Lunch, Dinner…Life! : Recipes and Adventures from My Home Kitchen, is due to be published later this year. 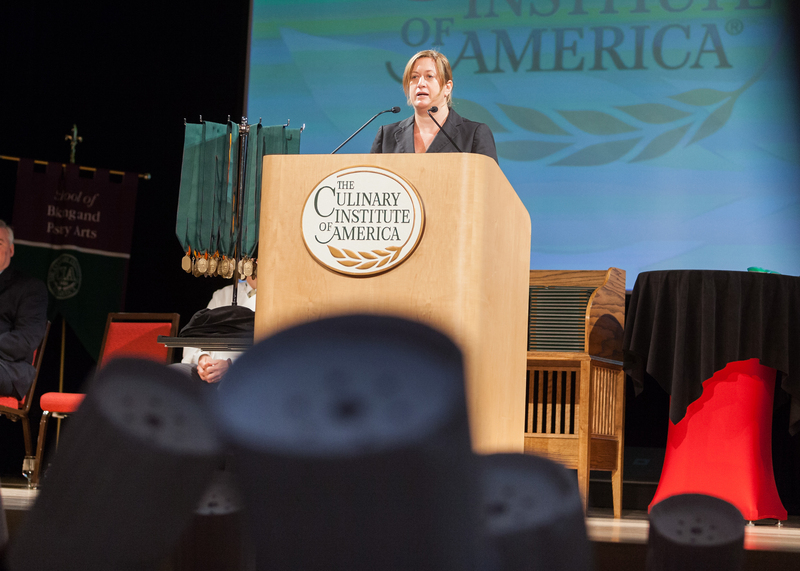 The entire CIA graduation ceremony, including Chef Robbins’s address to 56 recipients of CIA associate degrees in culinary arts and baking and pastry arts, can be seen online.